So I thought I was DONE with Dave Ramsey’s “Baby Step 1” which is saving $1,000 to start an emergency fund. Dave Ramsey is a financial guru who gives very “common sense” and “sound” advice on finances, debt, and building wealth. He has been on the radio answering finance questions for the past 25 years. 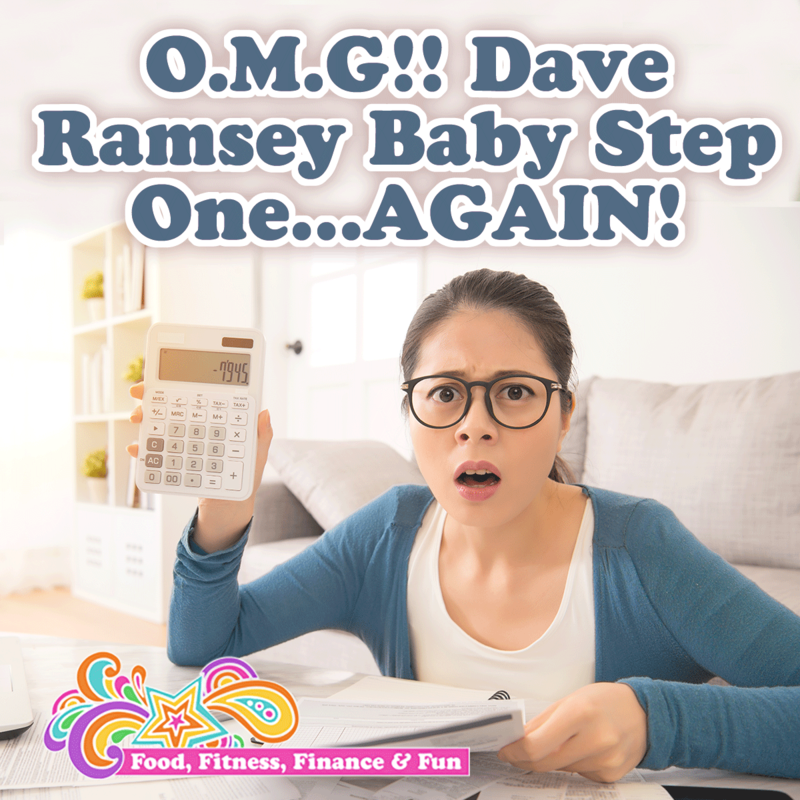 He has a general financial plan with 7 “baby steps” to help everyone get out of debt and gain more control of their personal finances. Baby step 1 is to start a small emergency fund of $1,000. I have already written several posts about my struggle and journey of getting started and finished with this first step. Here is the last one…HELP! Baby Step 1…AGAIN…UGH!! The last time I wrote about the baby steps, I was on baby step 4, which means I had already built up a full emergency fund of 3-6 months of expenses, for me that was $12,000. So imagine my disappointment in myself, when only 1 year later, I am back (yet again) to baby step 1, and working on building up my starter e-fund. RME! It’s not a shock why I am here, I chose all of it, and to be honest, I wouldn’t change anything that has happened in the past year, but I am ready (New Year’s resolution) to get my finances back on track, and I have to start somewhere…baby steps! So here I am, back to square one, at 45 years old, starting over, AGAIN! Only this time I am a different person. I have not once told myself how stupid, irresponsible, immature, lazy, or unfocused I am. I haven’t labored over how much I hate money and finances and budgeting (which I don’t anymore). And I have only shed one (maybe two) tears when I have felt anxious or overwhelmed at where I am because of the choices I have made. So what has changed? Maybe it’s getting older and wiser, maybe it’s loving myself more, or maybe it’s just that I know I am capable of starting over no matter what, because I have done it so many times before. My guess is that’s it’s all three! I have a plan. I have it written down. I have shared it with those that support me. And I am excited to focus again on making money and building a future for me and my family! Is there something in your life that you really want and have tried several times to have/get/do/be and have failed more times that you care to admit? Guess what? It’s OK!! You are OK! You are actually amazing! And resilient and powerful and forgivable and worthy. If it’s something you really want, get back up and go for it. I challenge you to do one thing today to move toward what that is. You can keep it a secret, or you can share with me, I will support you no matter what! Today I will follow up with at least 50 past customers in my Pure Romance biz to see if they need anything. Any money I make from any orders that come in, will go straight into my new emergency fund…baby step 1. And then I will celebrate! !